> Yes, I know it’s bloom day and time to report on what is going on in the garden. But my garden just ain’t that pretty right now and there are tarps and sawdust everywhere due to a remodeling project we are doing. So I’d like to talk about what is making my garden pretty right now. 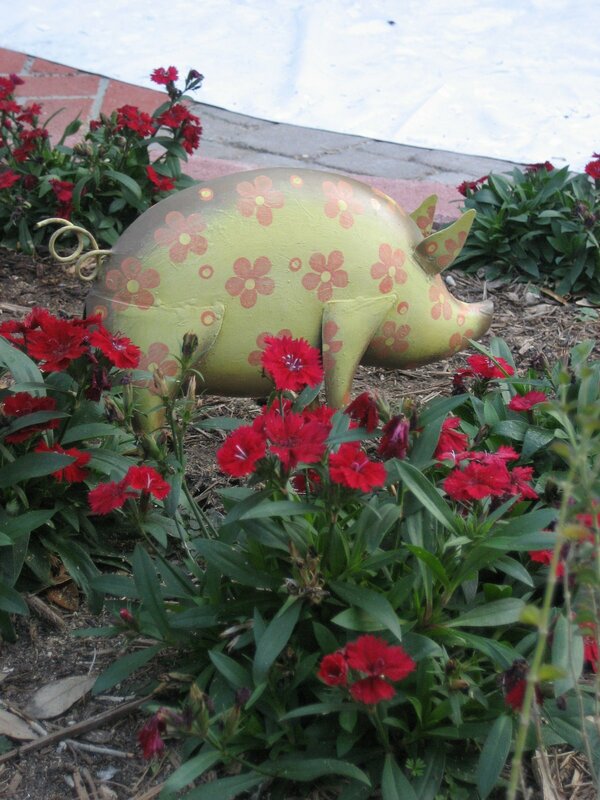 I’d like to introduce you to my garden piggies. I am normally not this kitchy, but I’ll go ahead and admit something right now that most people don’t know about me- except Christine because she has the same wierd passion. I collect pigs. Now wait, I am not one of those people who has an entire shelff around her kitchen ceiling overflowing with Pigs From Around the World. And I NEVER order any commemorative plates that feature pigs. And I do not have pig dishware…ummm, OK, I do have some little pig butter knives but that is just because my mom gave them to me. 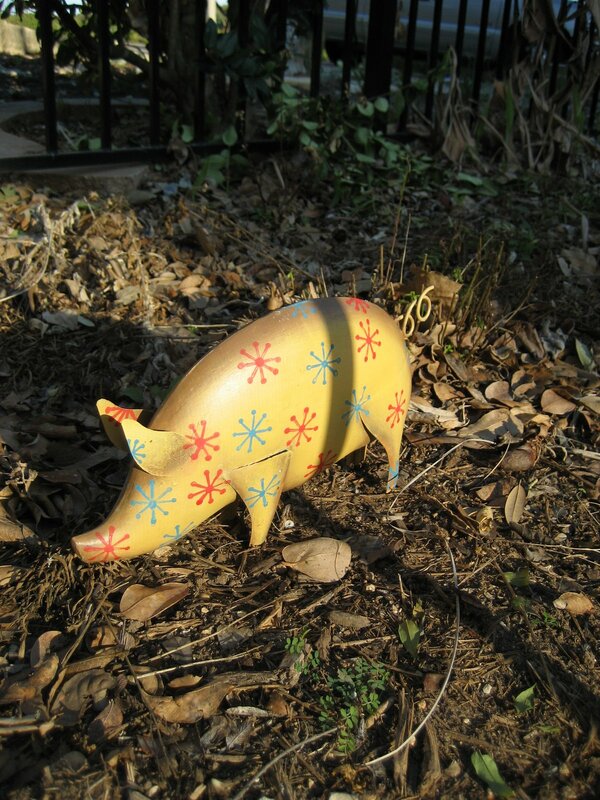 But I have collected pigs ever since I spent time in Asia and discovered that I was born in the Year of the Pig. So I have pigs here and there. Not really displayed, just tucked away in drawers. And then, right before Christmas, John was struggling with what gift to buy me. 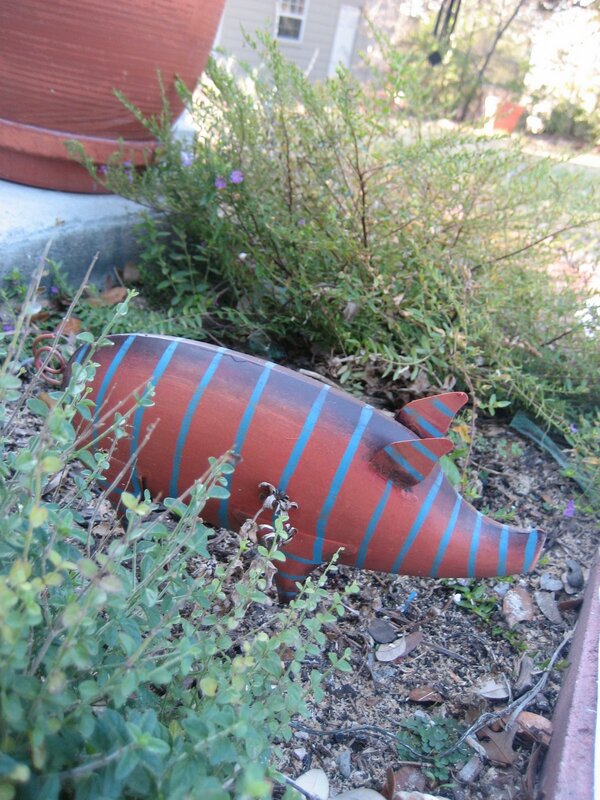 And I had just gotten the Gardeners Supply catalog and they had these garden pigs. Why not, I thought, I never go whimsical in my garden. So I gave him the catalog with the page dog-eared. “Really?” he said to me, looking at me kinda funny. And so, on Christmas morning, under my mom’s creche, stood 4 little piggies, looking right at home next to the manger, even though they were 50 times larger than all the other manger animals. And they came home and found their places in my garden. And every morning, Alex sits at the breakfast table and looks out the back window and shouts “Pigs!” in her 2 year old vocabulary- which means we hear “Wigs!” every morning. That’ll do, pigs, that’ll do. > I finally had to face the music today and admit that the freezes had done in my tomatoes. It was hard to give in as I was harvesting up to the week before Christmas, but a big freeze while we were away did the rest of them in. So today I thought- Gee, someone should get the benefit of these. I mean, a couple of them are still turning red even though the flesh is dmaaged and the insides a little mushy. Who would still love to have that for supper?? 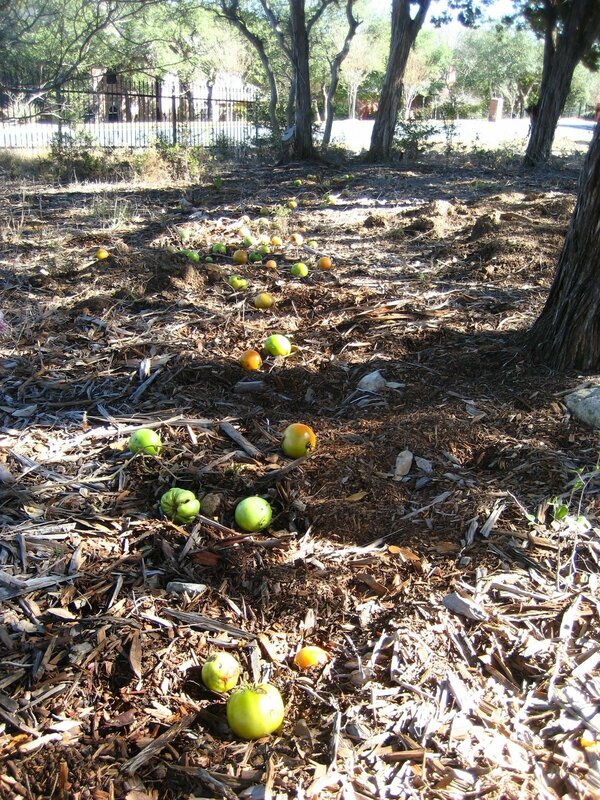 Then I remembered that we found a well-worn der path through our side yard th eother day and this seemed the perfect opportunity to provide them with some fresh food during winter. 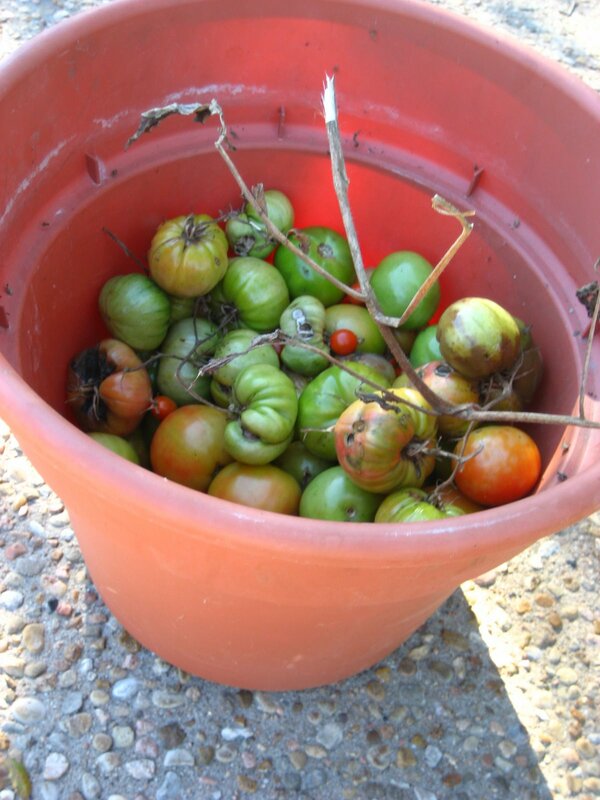 So I gather up all of the tomatoes that would still hold together and put them all in a large plastic pot. Then I walked along the deer path, sprinkling tomatoes as I went. I’ll keep an eye out the next few days to see if I attract a crowd. >Do You Miss the Rain? >I know, it’s still dry, dry, dry in Central Texas. It’s hard to remember what a banner year for water it was in 2007 when 2008 was so very parched. Come enjoy a free seminar on capturing rainwater and lowering water usage in your landscape. This session will cover all the basics of building a non-potable rainwater harvesting system. In addition, learn how to design beautiful gardens designed for lower water usage. 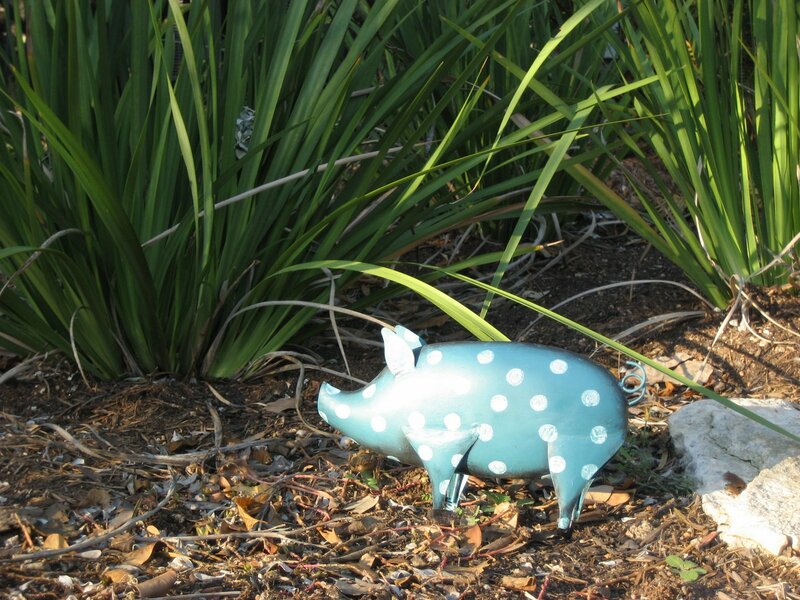 Don’t be misinformed, xeriscaping is not “zero-scaping”. Vendors representing tank and gutter companies will be available to answer specific questions. City of Austin representatives will be available to answer rainbarrel, permit and rebate questions. I’ll post more about future programs as they come up, including roses, spring prep, and veggie gardening. Hope to see some of you on the 10th!